Since Nicole was doing so well with her bootcamp training, we decided to introduce the other dog who would potentially become her new brother in her forever home. 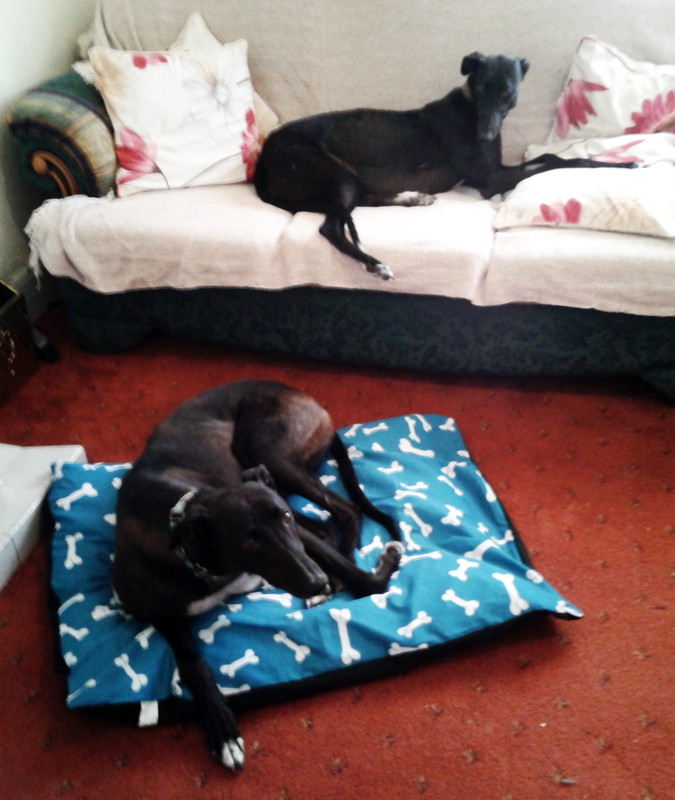 Callum arrived on a saturday and quickly made himself at home, being a cuddly, confident boy right from the start. Nicole was so excited to meet him, her tail was wagging at warp speed, so needless to say they got on like a house on fire! Callum had a longer racing career than Nicole, was a bit more inclined to chase, so he stayed in the muzzle for several days. 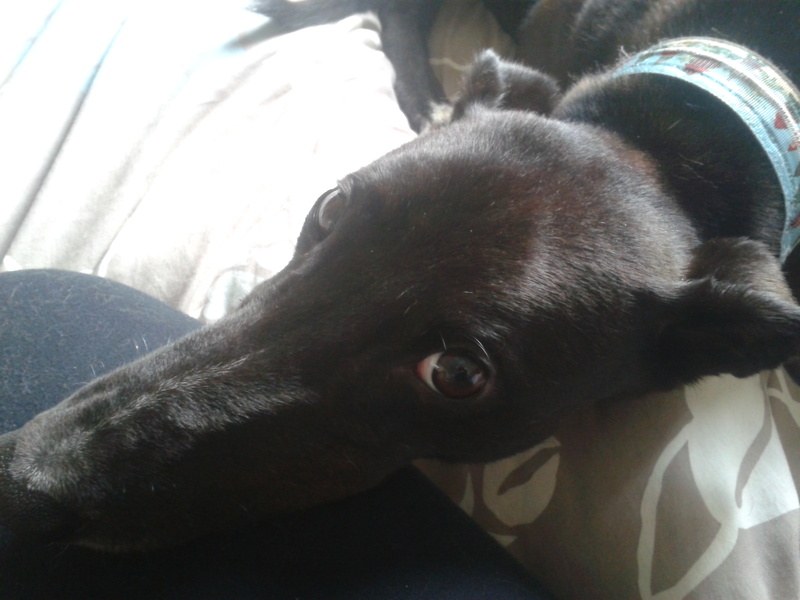 He is quite receptive to commands however and is very eager to please, always coming up for a cuddle and climbing onto your lap at any opportunity! 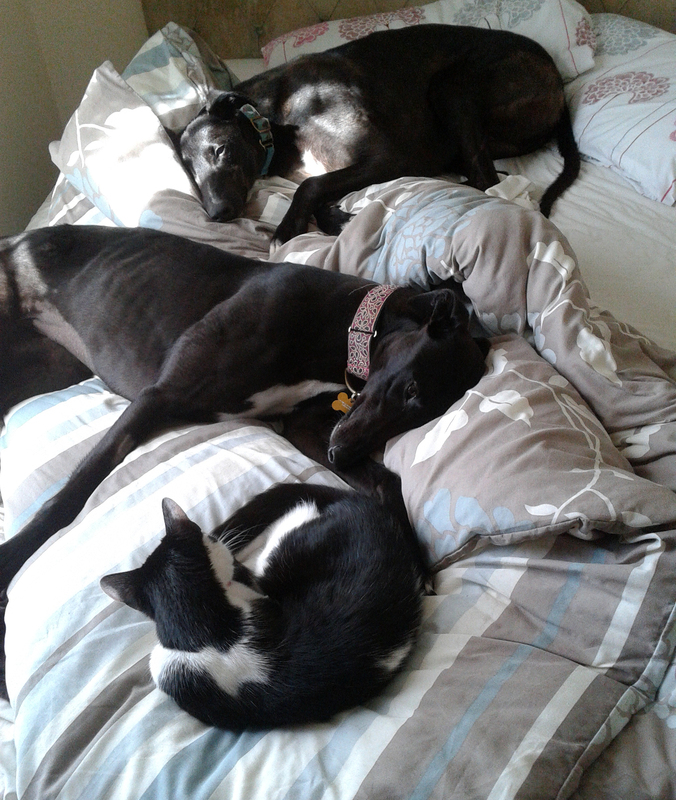 He wasn’t as keen to curl up with the cats, but they sensed this and didn’t try to push their luck with him. Nicole wasn’t always so pleased to share her (my) bed with him either, despite her shyness, she kept him in his place, giving a little growl that relegated him to the floor most days. She is the princess after all! 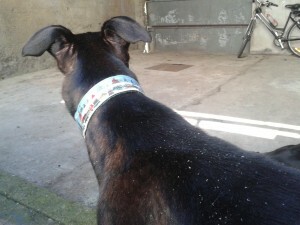 Like most of the greyhounds coming off the track, Callum came with very dry skin and bad dandruff which is especially apparent on black dogs. Nicole had a bit, but her fur is now in much better shape after a few weeks of better food and regular grooming. I used a rubber curry comb and other brushes to remove as much of the loose rusty fur and flaky skin as possible, which makes his dandruff look worse, but it needs to come off in order to improve. Ireland has also been experiencing a heat wave over the past couple weeks so all dogs and cats were shedding extra fur in response to the heat. And I was doing extra hoovering of course! Diet is most important in dealing with skin issues with greyhounds and as well as feeding a high quality dog food, I have been adding olive oil, fish oil and raw eggs to many of their meals to help combat the dry skin. A good friend of mine recently passed on the tip to feed uncooked porridge oats to their food, which contain niacin and thiamine to help grow healthy skin and hair, so I have been adding this to their diet as well. It will take a few weeks to see the results of the dietary change, but the oats are also supposed to be very beneficial when dealing with the bald thighs and other spots that greyhounds often experience. Since Callum and Nicole were both doing well with the cats, they have now gone to their new home where they will be living with one cat, who is more reserved than my two and will likely not show her face to the dogs for some time to come. Even though they have done well here, it is important for them to learn that this new cat is also part of their pack, so they will respect her and not treat her as something to be chased. In their new home, Nicole will now be known as Lucy and Callum is now Gaelin, and I’m very proud of my first graduates of the kitty bootcamp!